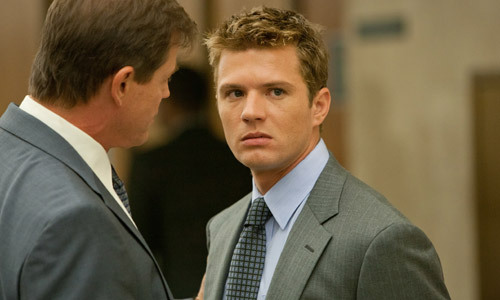 Ryan Phillippe is back on the silver screen this week as Louis Roulet, a wealthy young Beverly Hills realtor facing assault charges in the legal thriller The Lincoln Lawyer. I have a group of guy friends—there are eight of us—and every single Thursday for the past four years at least some of us have gotten together for dinner. We’re all transplants and we are like brothers. We always go either to Craig’s or Dan Tana’s. We’re trying to carve out our own piece of Hollywood history. I’m actually an investor in Craig’s. There I love the whitefish. When I want to go light, that’s what I get. I use it all the time. It’s so easy once you have an account and they are so fast. I tend to order in sushi a lot, and if I’m using LA Bite I order from Asakuma. They have really good, basic sushi. When the kids are around we get Chin Chin or CPK. I love that it’s so convenient, especially if you’re a parent and don’t have time to stop or shop. Now they have a feature on the Web site where you can track via GSP where the driver delivering your order is. The kids love it. I’m super into training. I train primarily at my house now, but my trainer and I sometimes hit the stairs at UCLA or go hike Runyon Canyon. I also play basketball at the courts in West Hollywood Park. That’s the benefit of living in this city. We have the best weather in the world. That’s a great motivator. I like taking people to the observatory for the view and for the history of it, the James Dean aspect of it all. You can see the Hollywood sign and all the way to downtown. It gives you a different awareness of the city. I also love taking relatives from out of town to Hollywood Boulevard to see Mann’s Chinese Theatre. We get jaded and used to those things here but it’s such an exciting thing for people who’ve grown up only seeing it on TV. It reconnects me to that enthusiasm. I’ve recently started going to brunch on the weekends at Mirabelle. I go there with the kids. We just really like that atmosphere. They make these crazy donuts there. We filmed The Lincoln Lawyer downtown, and I had never spent a lot of time there, so I got to discover it. It’s cool because I’m from the East Coast, and it felt a little like an East Coast city. I’ve seen so many amazing shows there. I am a huge Radiohead fan and when they played the Bowl it was so incredible. It was just the perfect venue for them. It’s going to sound funny, but it’s a sentimental place for me because that’s where both of my kids were born. We live close to it and drive by often, and they’ll point to which wing and floor and say ‘that’s where I was born!’ Those were the most important days of my life. When I first moved out to L.A. and didn’t have much money I’d go out and sit on the beach with a bottle of wine and my friends, so being there now makes me feel young. It takes me back to the beginning of my time in L.A. I am a huge hip hop guy and this kid has got that laid-back Cali feel. He’s sublime but with the rap skill of Eminem. I think this time next year he’ll be a household name. He’ll be at the Viper Room next month.